Emancipators make soap at the Clean360 factory in Oakland. “When I was 11 years old, I sold my first crack rock — you know, ’cause times was hard back then,” says Jessie James King, who grew up in West Oakland in the 1990s. Some of his older relatives sold drugs. But even so, they didn’t want him following in their footsteps. King stuck to the plan, for a while. It was the very thing his relatives had tried to protect him from. King got arrested several times for drug possession. But then in 2006, he got caught with 15 ecstasy pills. The felony was a game-changer: King spent eight months in Santa Rita Jail. When he got out, his job prospects were worse than ever. King was struggling, working sporadic construction jobs. But then he was thrown a lifeline. He joined the Emancipators Initiative, a program that helps formerly incarcerated people get a clean start — by teaching them how to make soap. “Who’d have ever thought you’d see brothers making soap,” he says. But the brothers are in fact making soap — at the appropriately named Clean360 factory in North Oakland. Thousands upon thousands of bars with exotic names like Lovely in Lace. Citrus Exfoliation. And Lemon Explosions. The factory is located in the back of a small-one story storefront at 41st and Broadway in Temescal. It looks like a restaurant kitchen, with lots of large steel pots and pans hanging on hooks. Bottles of fragrance oils line the shelves. Giant blocks of soap called “loaves” are piled in stacks, waiting to get cut down into bars. A mixture of melted oils fills a giant steel pot. Damien Bradley, one of the Emancipators, explained the next step. Mixing lye and fragrance into the oils, to turn it into something you and I can bathe with. “So we’re just adding air, kind of bringing the temperature down quicker,” Bradley said. He and three other men stood around the steel pot. One wore protective goggles and gloves. Between the super hot oils and the lye, they had to be mighty careful they didn’t get burned. Nearby, Charnay Bell, the lone woman in the program was using a blow dryer to shrink cellophane wrap over gift baskets stuffed with soaps and loufahs. “We’re still trying to figure out how to perfect it. If you hold on to it too tight it’s going to cause a hole, it’s a tedious process to say the least,” she said. But Bell isn’t complaining. She says the Emancipators gave her a chance when no one else would. She got in a bad fight in college in 2013 and got sentenced to 120 days in jail for assault. “I have over 150 applications that I applied for jobs after getting convicted of that misdemeanor, and I didn’t get one call back for an interview,” she said. It’s a small crew here at the factory, just six people. They’re all African-American. And they’re all hoping that graduating from this program will help them transform their lives. Jessie King, who once sold ecstasy, graduated in 2014. But he still drops in at the factory once or twice a week — to inspire the new recruits. Noha Aboelata, is CEO of Roots Community Health Center, the non-profit that runs the Emancipators program and the soap factory. Alameda County funded the pilot project in 2013. That funding has since run out. But Aboelata says the goal was always to create a social enterprise that would eventually be able to support itself. “So we just started thinking about, what does everyone need and what do we want to make? Actually, what it came down to was toilet paper and soap. I wasn’t crazy about the idea of toilet paper,” she says. It’s less likely that making TP would have given people quite the same sense of pride as producing all-natural soaps. 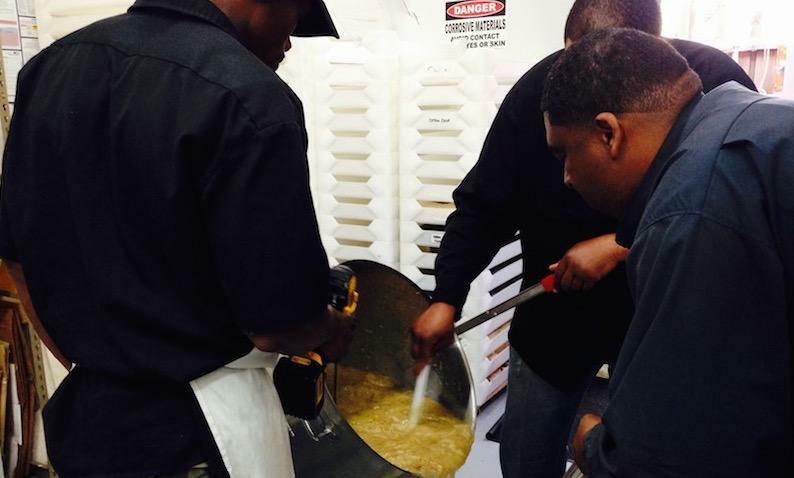 The Emancipators trains formerly incarcerated people for factory jobs; but that’s not all. “The way we approach it is everything from getting enrolled in any benefits that you are eligible for, getting counseling if that’s what you need, reunifying with your family, getting your license, getting all your legal affairs in order,” Aboelata says. “ And so it’s really a 360-degree approach that we noticing is leading to long-term employment. Graduate Jessie King’s factory job as an Emancipator has led him unexpectedly into the health field. He’s now working for Roots Community Health Center at its clinic in East Oakland. King now works with people who are in the same boat he once was in. He helps formerly incarcerated men and women get signed up for public benefits and get medical care. “Once we link them in with the good resources and we see that they’re working, then they grow wings and it’s time for them to fly away,” he says. King hasn’t yet left the nest for good, but he’s definitely taken flight. He’s now enrolled in a Community Health Worker certificate program at City College of San Francisco. And later this year, he and his longtime partner, who have three children together, plan to get married. Thanks to soap-making, he’s well on his way to making a clean 360.